Hope you're OK but I'm not. I have the flu. 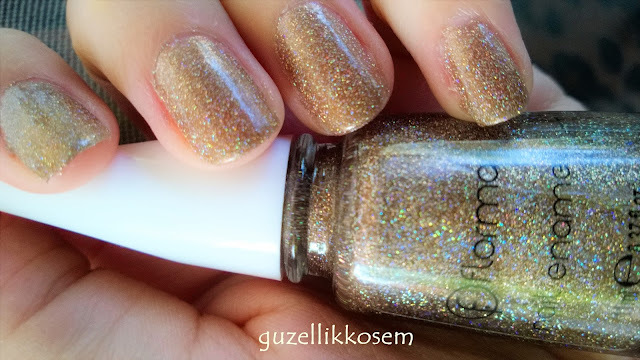 Today I'm gonna show you Flormar's so-called holographic nail polishes. These are on the line of Flormar Nail Enamel. As you can see, this polish has golden glitters in it. It doesn't say that I'm holographic but I can say that Flormar has tried to it. It is hard to remove as it contains a lot of glitters. If you are looking for a cheap holoic nail polish, you can consider buying it. This is more successful than Golden Orchid in holo. This is flash used photo. You can see its glitters. It is 3 coats on the photos. You can increase its effect by applying more coats as its formula is thin. I like this color more. You can give them a chance, I think. 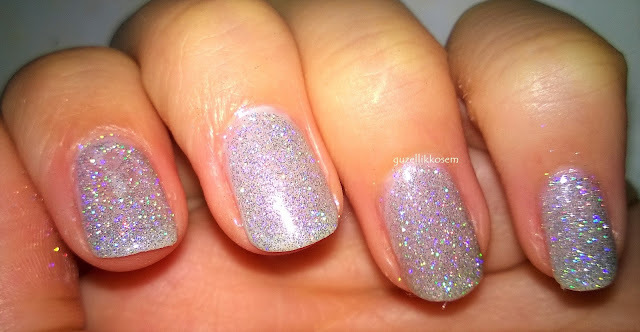 I want to find out cheaper holographic nail polishes.